You can adjust the all volumes on the device in a screen. 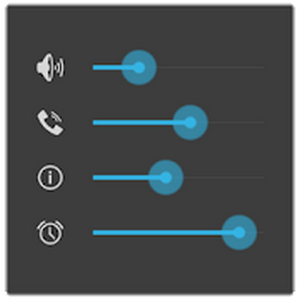 You can also switch to silent mode by pressing and holding the volume – button or by pressing it right after vibrate mode on a device that does not support silent mode switching with the volume button. Ringtone, notifications, and system volume might be linked to each other and work simultaneoulsy according to the manufacturer or the device, so test it by adjusting the volume slide. The actual alarms volume is different from the alarms volume displayed by this application in the devices which don’t use Android’s standard alarms volume, so test it before using. The volume levels displayed in the notification window might be different from the actual volume when using other applicaitons to adjust the volume. If there is no silent mode setting on the devices with Android v5.0 Lollipop or later, it will switch interrupt mode when silent mode.